Dr. James Jackson has been selected to receive the 2019 American Psychological Association’s Distinguished Scientific Award for the Applications of Psychology. This award “honors psychologists who have made distinguished theoretical or empirical advances in psychology leading to the understanding or amelioration of important practical problems”. The award will be presented at the APA Convention in Chicago in August of 2019. 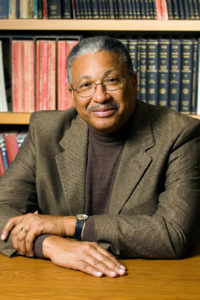 Dr. Jackson served as the Director of the Research Center for Group Dynamics (1995-2005) and Director of the Institute for Social Research (2005-2015), and was appointed by President Obama in 2014 as a member of the National Science Foundation’s National Science Board. Dr. Jackson’s research focuses on issues of racial and ethnic influences on life course development, attitude change, reciprocity, social support, and coping and health among African Americans. Dr. Jackson was recently awarded the 2017 President’s Award for National and State Leadership (University of Michigan). He is also the recipient of the Distinguished Career Contributions to Research Award (APA) and the James McKeen Cattell Fellow Award for Distinguished Career Contributions in Applied Psychology (APS). Read more about how James made history by becoming the University of Michigan’s first full-time African-American faculty member in the Department of Psychology, and how the James S. Jackson Emerging Scholars Fund honors and builds on his work as a scholar and mentor by providing modest but strategic research and travel grants to post-doctoral candidates and junior faculty members affiliated with PRBA.